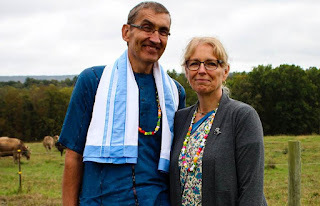 Special Sunday - Q&A with Partha & Uttama Prabhus ~ The Toronto Hare Krishna Temple! As mentioned in an earlier post today, Partha das and Uttama devi dasi, an inspiring couple from Saranagati, B.C., are coming to visit our GTA Hare Krishna communities this weekend. They will be conducting a special seminar at ISKCON Brampton and we are excited to announce that they will be facilitating the Sunday Feast at ISKCON Toronto. The Sunday Feast discourse will take on a special format with a moderated "Questions & Answers" session with both of these experienced devotees. The theme of the discussion will be "Building Strong, Happy Krishna Conscious Families". As a moderated session, the audience will have the chance to write questions down on little cards which will be read to Partha and Uttama prabhus, who will then answer the questions based on their years of experience in Krsna consciousness, their years of service on the Grihastha Vision Team and their 40+ years of marriage! How to Deal with Practical Challenges: Arguments, Finances, etc. All questions are welcome! We anticipate getting a good number of questions and will also be asking devotees to submit questions during the class itself. We will try our best to get through all the questions submitted.